I’ve spent the last hour with an empty word document open on my desktop, the key flashing on and off, echoing the blankness. I barely noticed this though, because I was flicking through Instagram and Tinder while I tried to find the words that were escaping me- an ironic image reflecting an equally ironic place in time for human expression. Is it selfishness? Is it laziness? Is it a complete lack of awareness? Plenty of middle-aged, right-wing journalists and other professional criticisers would be very content to argue the position that people have leaned into a new found sense of “complacency” otherwise not seen in the human race. I would argue that this position - to reduce technically advanced communication over a huge range of platforms to ‘anti-social behaviours’ - is in and of itself lazy. It demonstrates a lack of understanding about a whole new set of social cues, idiosyncrasies, ironies (and post-ironies). It ignores, too, a new social intuition; the politics of snapchat streaks, strategic seening*, and how to create visibility for your instagram account through witty bios and vague altruisms. This attitude is a repetition of a vast human history of people not liking new things that they don’t understand, things that change the status quo. In many ways, it seems that human nature has been completely unaffected by its new close companion. Just because things have changed, is that wrong? 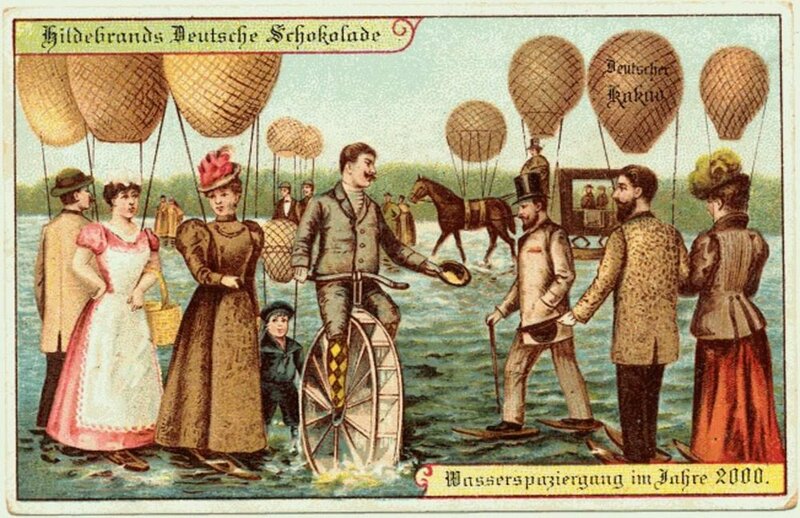 While we seem to have great ability to imagine the possibility of technology, we can only imagine it insofar as its relates to ourselves; that German illustrator in 1910 wanted to walk on water, our parents’ generation wanted to use the internet on desktop computers to aid with the speed of business interactions. Beyond that, the development of further technology seems a step too far, or pointless and destructive – there’s an innate human inability to look beyond the needs and wants of the self. The great power of social communication technology is in its ability to adapt, and the great genius of its intrinsically selfish nature – the experience is all about the individual user and fulfilling their immediate wants and needs; a message to a group chat, a flirty text to a date, FaceTiming your dog. All of these things are selfish – they’re about you, and your wish to reach out and connect with someone or something. But all this reaching out leaves a pattern, a web. This web is unlike any previous human technology; it learns, remembers, and progresses, it fixes holes in the data, and it’s constantly evolving and adapting by itself, but in conjunction with our constant and tireless input. In a blind sort of way, every time you reach for your phone, you’re editing the system, you’re looking to the future and you’re wanting to include others in your present. You may say something, you may say nothing. Either way, it ends in the same result.